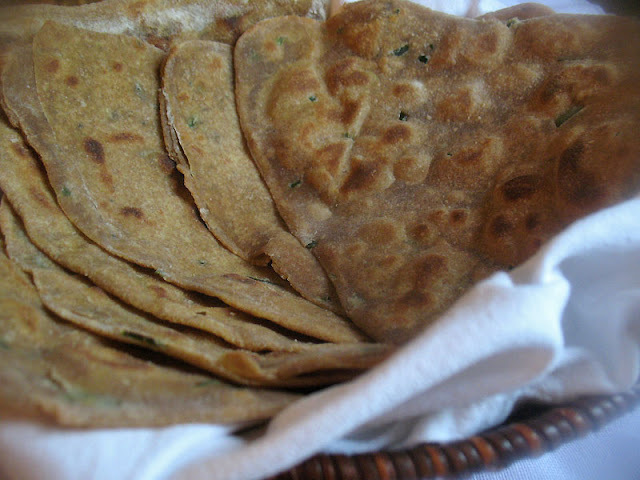 Indian meals are always a special treat when served with homemade flat breads. 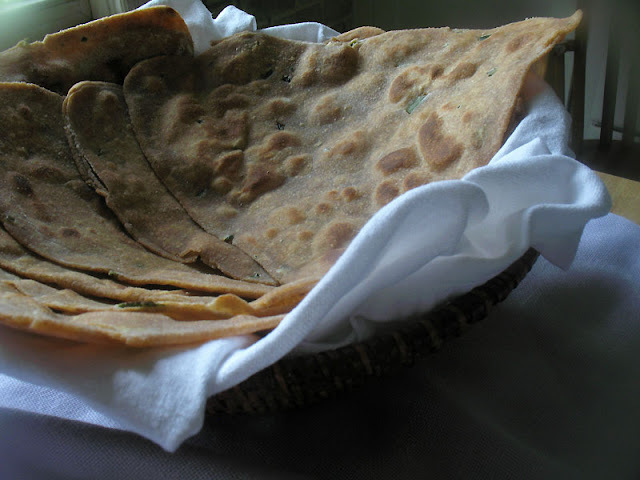 One of my favorites are flaky and substantial parathas, a griddle-fried bread often made with whole wheat flour and folded over a few times during the kneading and rolling process to create a layered bread that puffs during frying. They tend to be somewhat rich, especially if you use ghee or butter, as they are brushed several times during rolling and drizzled with butter or oil while cooking. Sometimes they are stuffed with vegetables and chutneys. Whether stuffed or more basic, they are always delicious as a snack or meal accompaniment. In a medium bowl, whisk together the flours, salt, sugar, chilies and ajwain and cumin seeds. Drizzle in the sesame oil and, using your hands, rub it into the dry ingredients until well blended. Gradually add the water until the everything comes together to form a fairly stiff dough. Knead in the bowl for about 10 minutes. Form the dough into a smooth ball, brush with a bit of oil, cover with a clean kitchen towel or plastic wrap, and leave to rest for a few hours. Knead the dough a few times and divide into 10 pieces. Shape each piece into a ball and transfer to a plate. Cover with a damp kitchen towel so they don't dry out. Flatten a ball of dough into a roughly 2-inch round patty, sprinkle with a bit of flour, and then transfer to a lightly floured board. Roll the dough out into a roughly 5 to 6 inch round, dusting with more flour as necessary to prevent the dough from sticking. Brush the round with some melted ghee, butter or oil, and then fold in half. Brush the half with a bit more ghee, butter or oil, and then fold into a quarter-circle. Dust with a bit of flour and roll out into a rough 5 to 6 inch triangular shape. 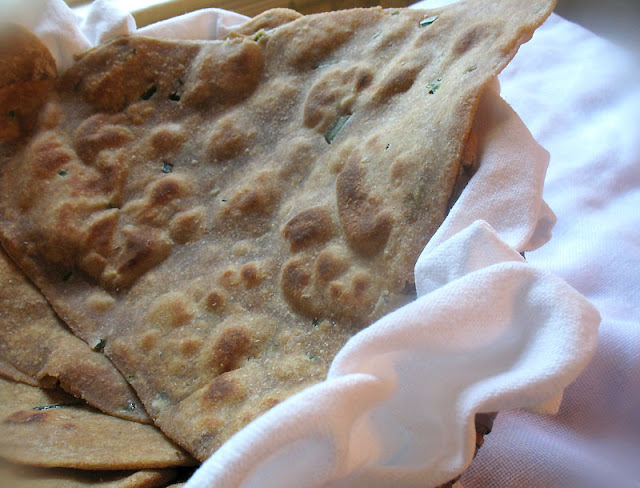 Repeat with the rest of the breads, separating each paratha between sheets of parchment or waxed paper. Brush a skillet with a small amount of ghee, butter or oil, and heat over medium heat. When hot, transfer one of the breads to the pan. Fry for about a minute, and then drizzle the edges and top with a bit of ghee, butter or oil. Let cook for another few minutes, until golden brown. Flip the bread, drizzle a bit more ghee, butter or oil around the sides of the bread, and cook for another few minutes, until golden and puffy in spots. Transfer to a plate lined with foil, or a basket lined with clean kitchen towels, and cover. Repeat with the remaining parathas. Note: The dough will keep well for up to 24 hours before baking. Cover the kneaded dough in the bowl with plastic wrap and keep in the fridge until ready to use, taking it out an hour or two before frying. I've never made parathas, but I love eating them when my coworkers bring them in. This corn-stuffed version sounds awesome! We don't eat Indian, apart from dal very often as Graham never seems to be in the mood for it and Cooper isn't keen. I shall try it with dal, everyone loves that. I need to come live with you so I can enjoy lots of curries without my fussy boys. I wish you did live close by. We could enjoy each others cooking.